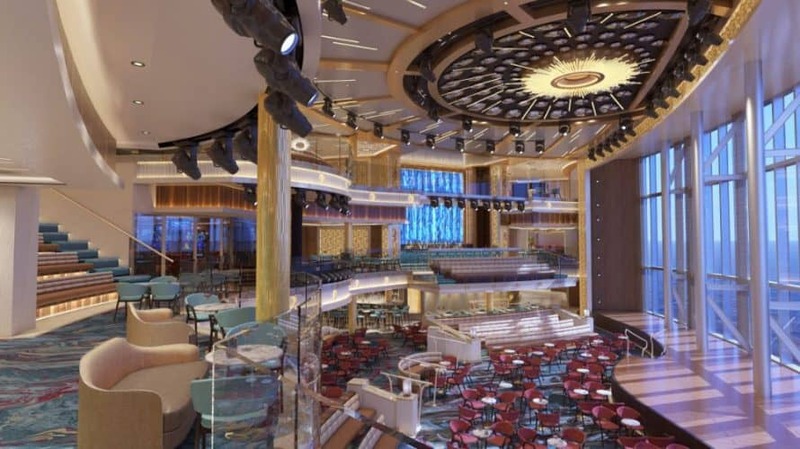 Carnival Cruise Line has revealed the first look of inside the Mardi Gras cruise ship which will arrive in 2020. Shiny new renderings have been released of what some of the public spaces will look like when construction is completed. 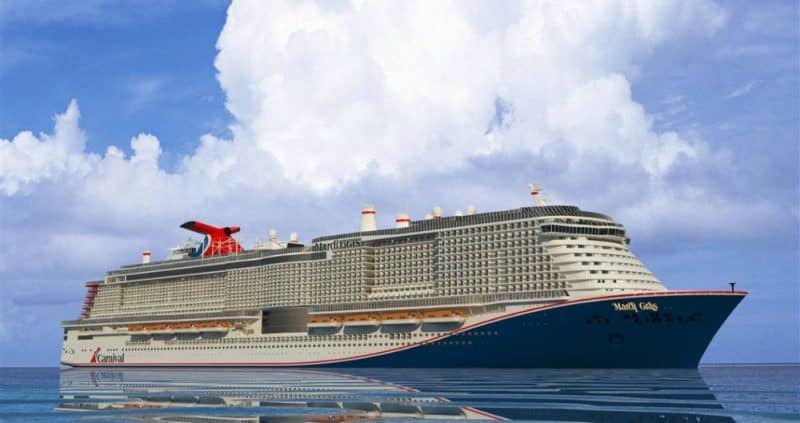 The cruise line has released further details of the most anticipated future cruise ships which will arrive in 2020. New renderings have been released showing what some of the interior and open deck public spaces will look like. Carnival will be bringing some popular guest favorites to the ship along with the introduction of new concepts. This isn’t surprising as Mardi Gras will be a completely new -class vessel for Carnival and the first fully powered Liquefied Natural Gas (LNG) ship in the fleet. 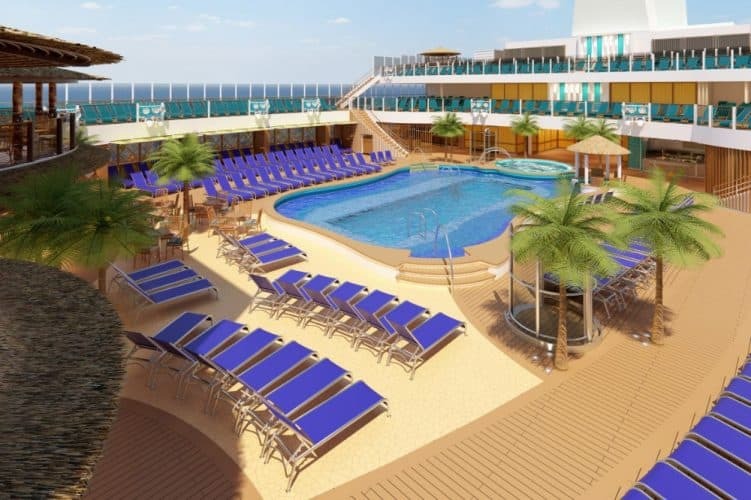 The ship will feature six different themed zones will be based around Grand Central on decks 6-8 mid-ship, French Quarter on deck 6 aft, La Piazza on deck 8 mid-ship, Summer Landing on deck 8 aft, Lido on deck 16-17 aft and The Ultimate Playground on decks 18-20 aft. Let’s take a look at the details Carnival has released for each themed zone with what they include. Creating a sense of wonder the moment guests step on board, the transformative Grand Central takes the traditional atrium concept to new heights, combining a day-to-night entertainment complex with spectacular three-deck-high floor-to-ceiling windows and a bar overlooking the starboard side of the ship that will be the perfect venue for socializing and people watching amid sweeping ocean vistas. Steps away are Bonsai Sushi and Bonsai Teppanyaki which are being expanded from designs on existing ships to reflect their popularity with guests. There’s also the first-ever dedicated Punchliner Comedy Club where guests can enjoy nightly shows, and the always popular Piano Bar 88 for sing-a-longs that bring guests together in an intimate feel-good setting. In a nod to the New Orleans’ culture that combines lively entertainment with an unparalleled food scene, French Quarter will be lined with new bars, music and eateries that perfectly capture the festive spirit of the Big Easy. And since the spirit of New Orleans is so closely tied to the jazz scene, this neighborhood is linked via a two-deck-high promenade leading to a traditional New Orleans jazz club with live entertainment and refreshing hand-crafted libations. 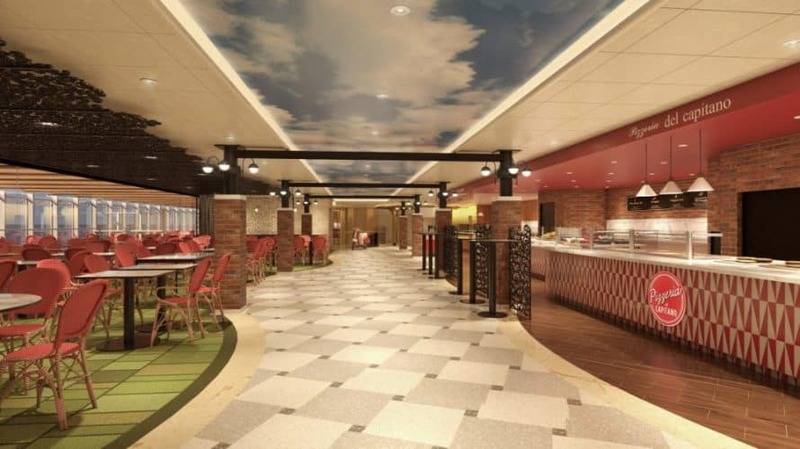 More details on these new dining and entertainment choices and the introduction of a new Carnival celebrity partnership will be revealed this spring. At La Piazza, guests are transported to Italy where they celebrate the rich heritage of Carnival’s senior officers with authentic cuisine from the casual family-style Cucina del Capitano and 24/7 Pizzeria del Capitano to a new Mediterranean-themed seafood restaurant. There’s also a bar where guests can savor cappuccino by day or classic Italian cocktails at night, while roaming musicians keep everyone entertained. Designed as the ultimate chill spot, Summer Landing will be home to an expanded Guy’s Pig & Anchor Smokehouse Brewhouse with smoked-on-board barbecue favorites created by longtime Carnival partner Guy Fieri, along with the line’s exclusive ParchedPig craft beers brewed right on board. For outdoor summer-inspired fun, there will be a pool and whirlpools, a new bar, the lunch counter for the Smokehouse Brewhouse along with ample lounging spaces and hang outs, making this the ideal spot to enjoy all the fun that a Carnival vacation experience delivers. The aptly named Ultimate Playground will span Decks 18-20 and offer guests amazing sea vistas as they soak up the sun and the fun in this spacious family-friendly play area highlighted by the largest and most elaborate Carnival WaterWorks aqua park in the fleet, along with an expanded SportSquare. The Ultimate Playground is also where guests will find the much-anticipated BOLT: Ultimate Sea Coaster, the first rollercoaster at sea announced in December 2018, where riders race along an 800-foot-long track achieving speeds of nearly 40 miles per hour. 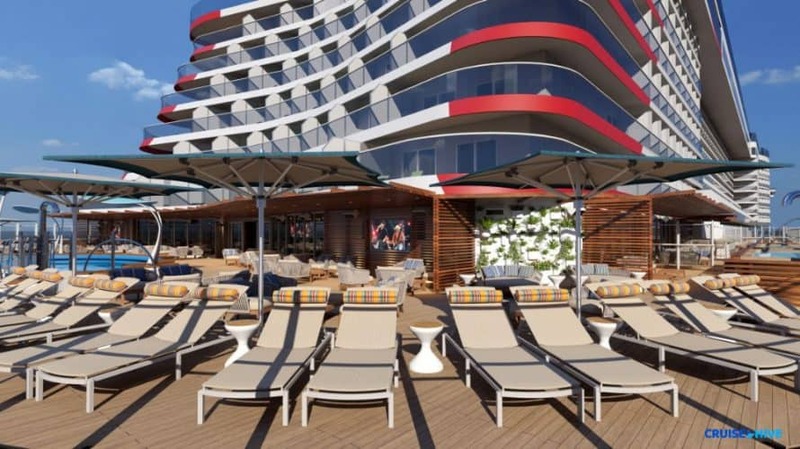 The new class Carnival cruise ship will feature 20 different stateroom categories and luxury suites along with expansive open decks, more than any other ship in the fleet. Also, expect to have the wow factory from a stunning Grand Atrium. 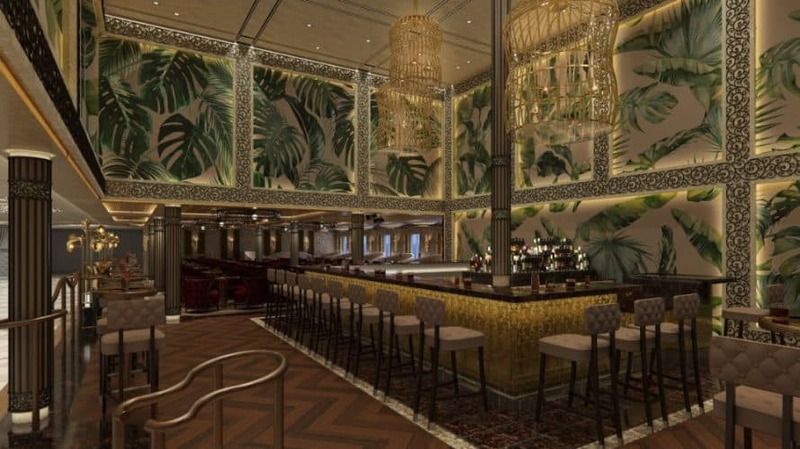 Mardi Gras will be receiving all those hugely popular FUN 2.0 features such as Alchemy Bar, Fahrenheit 555 Steakhouse, Serenity adult-only retreat and many more. 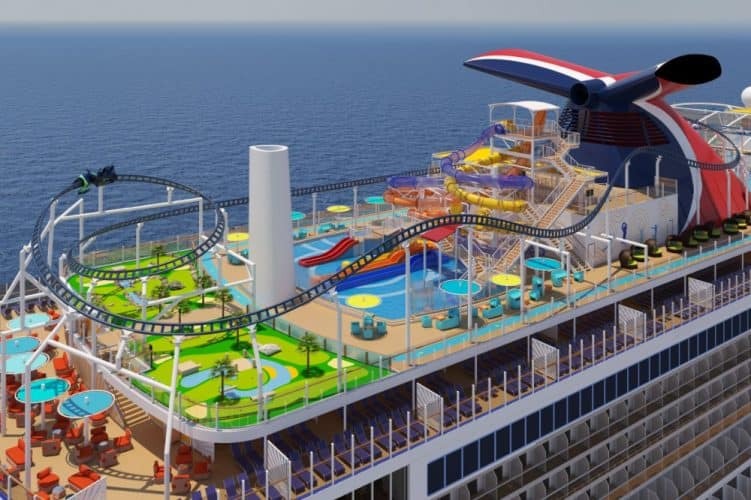 Also Read: Carnival’s Mardi Gras Cruise Ship to Feature World’s First Roller Coaster at Sea! More specific details will be announced in the future on cabins, public spaces and more. 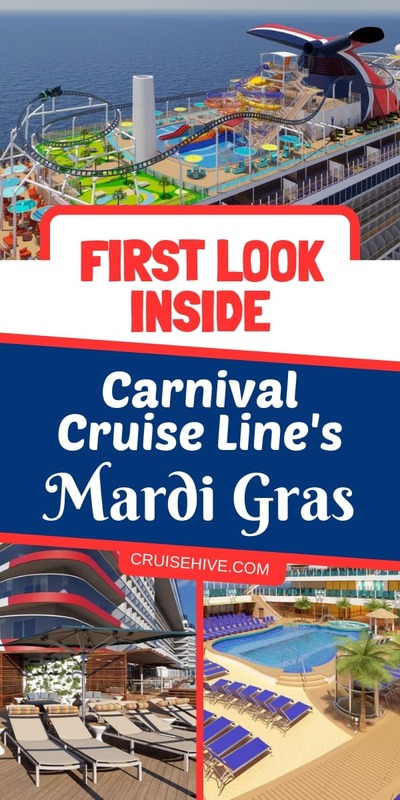 Carnival Cruise Line will be announcing the Mardi Gras itineraries on January 30th, 2019 so do keep checking Cruise Hive for all the latest on that. The 180,000-ton cruise ship is currently under construction at the Meyer Turku shipyard in Finland. She will cater for 5,200 guests at lower birth. The ship will be based out of Port Canaveral, Florida once she arrives from Europe to the U.S.